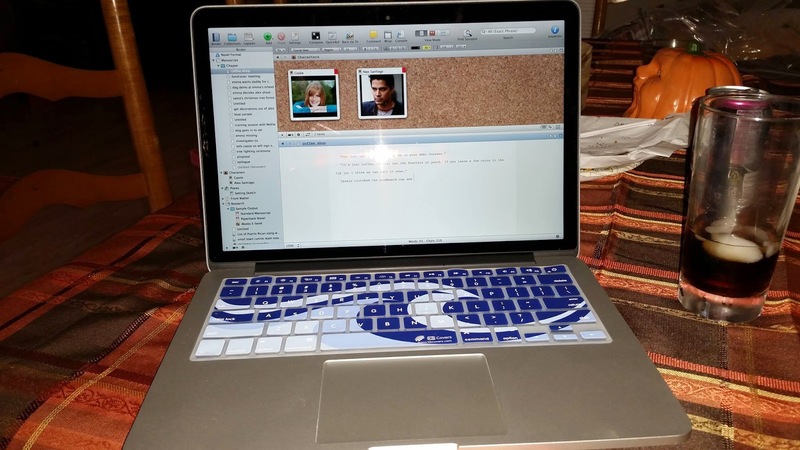 Katie Meyer: Scrivener, what is it, and why do I love it? Scrivener, what is it, and why do I love it? Scrivener is a software product designed for writers, by writers. Specifically, it lets you break large writing projects into manageable chunks. Each chunk has it's own folder or text file, clearly labled, in the "Binder", displayed as a side bar. Then, when you are done playing around, rearranging, or otherwise working on the smaller parts you can "compile" everything into one document. When you are finished you can save that document in a multitude of different formats, including rich text files, Word compatible files, epub, mobi, PDF, and more. You can also color code each "chunk" of information, assign labels, view as index cards on a grid, take snapshots of work before changing it, roll back to a previous snapshot, and so much more. A huge plus is the Research section of the binder. You can use this to store all the files you might need to access while writing, be they images, text files, even websites. The split screen feature lets me keep my research right in front of me while I type, saving time clicking from window to window. And then there is my absolute favorite part--the project targets option. You can open a status bar that changes from red to orange to yellow to green as you reach your daily and project goals. If you have a set deadline it will even calculate for you how much you need to type each day and adjust the daily targets based on your output. The Mac version has many more features than the Windows version, which is why I now own a Macbook Pro, but the Windows version is still wonderful and lightyears ahead of other, similar programs I tried. Prices are incredibly fair, with educational discounts for students/educators. And they offer an incredible 30 day free trial (30 days of actual use...so if you go a week without using it they don't count that as part of the trial). They are also offering discounts for those participating in NaNoWriMo, making this an excellent time to give it a go. And no, I don't receive any money or other compensation from them. I'm simply in love with the software and wanted to share my experience. Consider me a true believer spreading the word. And if Scrivener still doesn't sound right for you, that's fine. They even offer a list of alternatives here.